Q. What is the Upper Ridge? 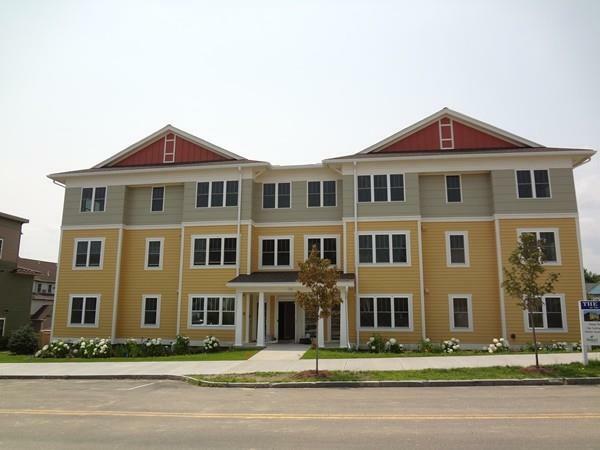 A. It’s a phased 28-condominium project at Village Hill in Northampton, containing townhomes, flats, and single-family homes built or being built by Wright Builders. It’s now in its third phase, comprising townhomes and the Flats. The Flats is a classic Arts & Crafts style building offering one-level living, with two units per floor for a total of six units. A central elevator runs from the underground garage up to the top floor. The first Flats building has been completed; the second Flats building will be completed in 2016. The final phase of the Upper Ridge, with construction expected to begin in 2016, will include three single family homes – likely a Victorian, a bungalow, and a Craftsman-style, and one duplex, with one 2-bedroom unit and one 3-bedroom unit. Q. What does the monthly condominium fee cover, and how much is it? A. Fees vary depending on the type of home and location. Generally, condo fees cover master insurance, exterior maintenance, road maintenance, landscaping, refuse removal, and reserve funds. The fees for the Flats also cover common area cleaning and window washing, periodic garage cleaning, common electric for HVAC in the lobbies, lighting in the lobbies, and elevator maintenance and inspection fees. Remember that fees are based on the purchase price of a unit, because according to state law, value, not square footage, drives condominium share. When a new unit receives a certificate of occupancy, the fees for all units are recalculated. Q. Who manages the property? A. Hampshire Property Management Group. HPMG is the first point of contact for owners. Q. Is there a condo association? A. Yes. When all four phases are complete, the Upper Ridge Condominium Association will be turned over to the unit owners, in keeping with the development’s bylaws.]. Until then, the association trustees are Mark Ledwell, Linda Gaudreau, and Jonathan Wright, all of Wright Builders. The Flats will have its own association, which has the same trustees as the Upper Ridge association, until there are owners there to take over that function. For more information about Village Hill, email Alyx Akers or give her a call at 413-320-6405.